U.S. Rep. Lamar Smith, R-San Antonio, chairman of the House Judiciary Committee, took his efforts to require nationwide use of the electronic employment verification program, known as E-Verify, before his committee today. “Yes, E-Verify is a jobs killer, but only for illegal workers,” he said. Employers who rely solely on the documents their workers provide to ensure they are legally qualified to work in the United States may be in for a shake-up if U.S. Rep. Lamar Smith gets his way. The San Antonio Republican who is chairman of the House Judiciary Committee, took his efforts to require nationwide use of the electronic employment verification program, known as E-Verify, before his committee today. The bill, HR 2885, also called the “Legal Workforce Act,” would replace the current system that relies on the paper-based I-9 employment form, which he calls obsolete. Employers in industries commonly associated with hiring low-wage immigrant workers, authorized or not, usually rely on information their employees supply on I-9 forms to prove that they are complying with federal laws that require employees to have legal status. 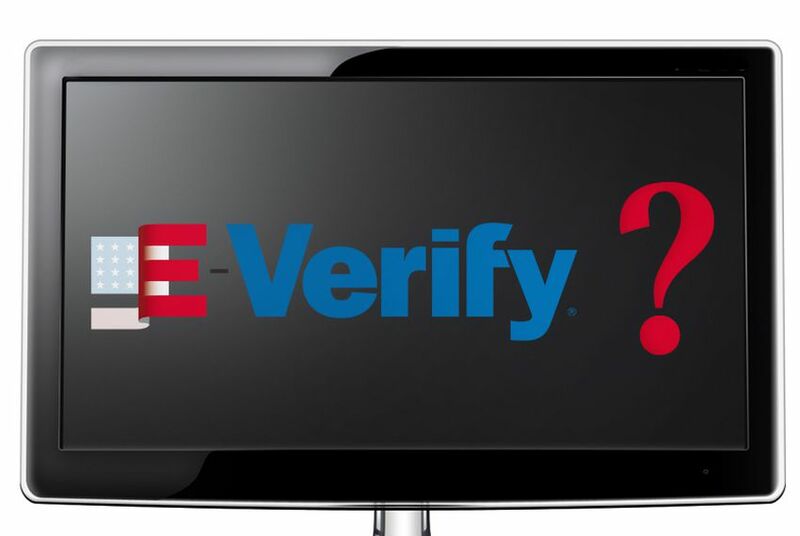 Smith contends that using E-Verify would not only safeguard employers against false information, but it would also open up millions of jobs for legal U.S. residents and citizens who are out of work or underemployed because of the weak economy. “It makes no sense to rely on the paper-based, error-prone I-9 system when a successful, web-based program is available,” Smith said. “A few have claimed that a federal E-Verify requirement will cause job losses. Yes, E-Verify is a jobs killer, but only for illegal workers,” Smith told the committee. Opponents of E-Verify have labeled it a "job killer" because they say data in the system is often erroneous and results in qualified workers being denied jobs. “It is prone to not doing the job it should be doing,” said U.S. Rep. Sheila Jackson Lee, D-Houston. “Is the software up to the task?" Jackson Lee also said it was incorrect to suggest that work currently performed by immigrants will be automatically replaced by citizens and legal residents, some of whom avoid blue-collar and agricultural jobs. She said that in Houston, illegal immigrants contribute about $27.3 billion to the gross regional product. But Smith said the system has been vastly improved, and he cited statistics from the U.S. Citizens and Immigration Services, which operates E-Verify. The Center for American Progress, a progressive, Washington-based think tank, supports E-Verify, but cautioned that its immediate implementation could actually cost billions in tax revenue. The organization argues that E-Verify should be part of a broader push for comprehensive immigration reform. “The overall problem is that unless you do something about the 7 million workers who are unauthorized, those who get caught will go further underground,” said Angela Maria Kelley, the center’s vice president for Immigration Policy and Advocacy. There is no evidence that illegal immigrants will leave the country if they can't find legal work, Kelley said. Instead, they will likely get jobs that pay cash and don't contribute to the tax rolls. In Texas, more than a dozen bills were filed during the state's 82nd Legislature earlier this year that would have required certain employers to use E-Verify. But opponents, including several Republicans, raised concerns over the system’s accuracy and costs. A few of the bills were heard in committee but none passed. That drew a harsh rebuke from immigration hard-liners who insisted Texas business owners were more interested in cheap labor than in complying with the law. Some also raised concerns about federal preemption, and whether state governments could enact their own immigration laws. The U.S. Supreme Court, however, ruled in May that the state of Arizona could ensure its employers were hiring legal workers. In that case, Chamber of Commerce of the United States v. Whiting, the high court ruled 5-3 the federal government’s Immigration Reform and Control Act did not preempt the Arizona law. The law allows Arizona's state government to revoke the business licenses of employers who knowingly hire illegal immigrants, and it mandates the use of E-Verify. Smith’s bill has earned the support of several groups, including the National Restaurant Association, the U.S. Chamber of Commerce and Associated General Contractors of America. It was left pending before the committee and is scheduled for discussion again next week.